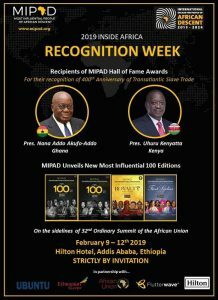 We at #MIPAD congratulate the President of Ghana Nana Akufo-Addo & President of Kenya Uhuru Kenyatta on their MIPAD Hall of Fame Recognition and Award on the sidelines of the AU Summit in Addis Ababa Ethiopia, Feb 2019. Click here to view the schedule. For their courage and dedication to the spirit of Pan Africanism and commitment to the global African Diaspora. Check out our YouTube channel to Watch the video on the Door of Return tagged “Year of Return” here Don’t forget to subscribe too.